This article was revised on October 4, 2016. Working out? Totally not my thing. At all. Yes, I’m a yoga teacher, but that’s more of a “work in” for me. Maybe one happy day I’ll find the exhilaration of lifting up things and putting them back down again, but until then, I’ll just stick to yoga and some other things that are so fun that I can’t even tell I’m working out — yay! Here are 7 fun ways to disguise your workouts (and how to do them for super cheap)! All-levels are welcome — no experience necessary! Climbing is a total body workout and burns over 700 calories per hour! I recommend Coral Cliffs in Fort Lauderdale. Abby, the owner, is a total sweetheart and a badass, too! Call ahead to book a class if you’re a beginner. This activity is a little bit pricey so expect to pay about $50 your first time for gear rental and a lesson. 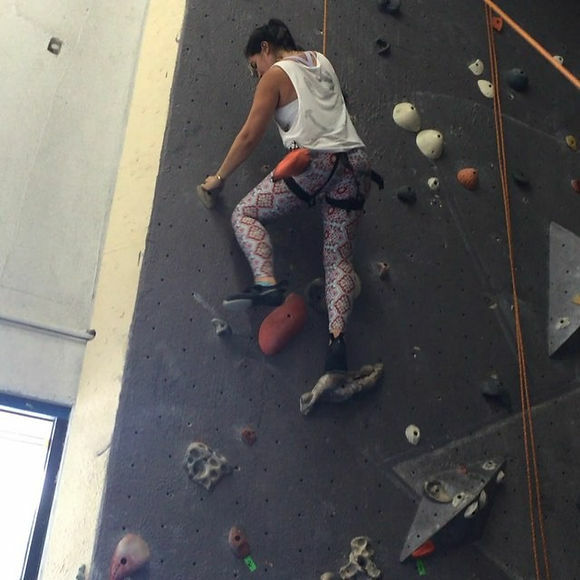 FAU students can climb for FREE at the outdoor rock wall. Non-FAU students can pay $10 for a day pass or $20 for a monthly membership. Enjoy the beautiful Florida waters and wildlife as you burn about 600 calories per hour! Sports in Deerfield or join Chelsey with What’s Sup for a guided tour. 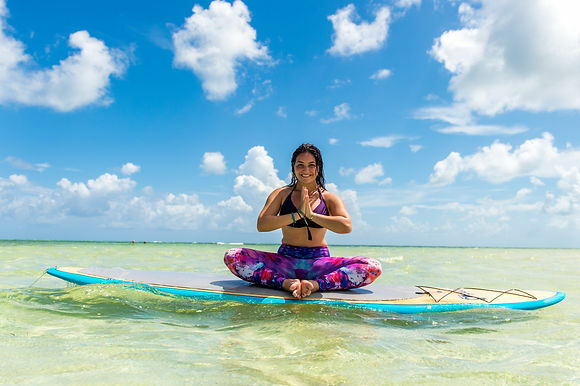 For an even greater challenge, take a SUP yoga class with Heather or Catherine! For more information on SUP yoga, check out my feature on TwoSeventy.com! class will have you burning about 500 calories per hour! Your instructor will guide you through a strong strech and warm up before helping you wrap yourself up in the beautiful silks. 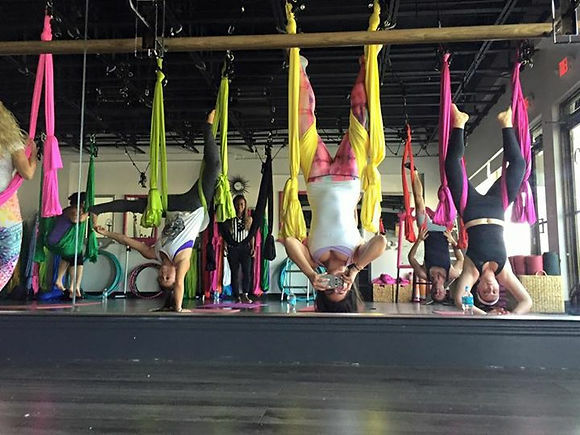 Check out Defy Gravity Yoga in Boca Raton! Your first class is $20 and you’ll get to come back for a second class for free! can trapeze, I promise. I’ve been a few times and I’ve done it by myself almost every time, so if you have boring friends, you have no need to worry! Classes are generally in a group setting of about 12 people and last an hour and a half to 2 hours. Your instructor will teach you the basic cues; you’ll know when to hop, when to reach your legs up the bar, when to let your legs down, and a back flip down. That might all sound difficult, but when you have the momentum going, I promise it’s pretty easy — and fun! At the end of class, you’ll probably learn to do a catch! You’ll burn about 300 calories per class and work your arms and core, mostly. One class will cost you about $50. 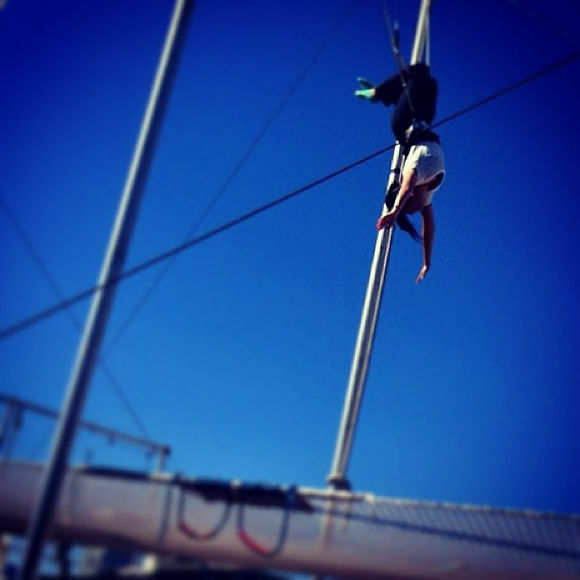 Check out Aerial Trapeze Academy in Palm Beach. Alright, so maybe you won’t tell your mom about this one (unless you’re Kim Kardashian and your mom comes with you, but we won’t go there). This is the latest craze in fitness because it seriously works your entire body and burns about 350 calories per class! And yes, guys can do this, too! Bring your open mind, a water, and a towel, and leave your judgement at home. If you’ve ever seen someone pole dance, you’ll notice the incredible skill it takes to maintain the grace and integrity of each pose while working your body hard. Try this Brazilian mix of martial arts, dance, and acrobatics, pronounced “cap-wearer.” This is a fun class for all levels, regardless of acrobatic skill (note: there was lots of laughing involved when I did it!). Ooh! And there’s funky music, too! You’ll burn about 500 calories per hour and work your entire body. Check out Velocity Martial Arts in Pompano Beach, Boca Raton, Lighthouse Point, Margate, or Deerfield Beach, and enjoy this Groupon for a month of classes! A fun way to bring out your inner little kid and burn off a lot of energy, as well. Jumping on a trampoline burns about 400 calories per hour while working your abs, legs, thighs, and booty! Here’s a Groupon for Ninja Lounge in Miami!